December 12, 2010 11:35 am By Lori Post contains sponsored/affiliate links and I get commissions for purchases made from links. As an Amazon Associate I earn from qualifying purchases. A few weeks ago, Walmart issued a challenge: to see what I could whip up in the kitchen for $5 or less. As far as homemade gifts go, I’ve always loved receiving Gifts in a Jar. So I set out to find the top five recipes and share them with you. Number three on my list is this yummy Friendship Soup. In a 1 quart, layer the split peas, bouillon, barley, lentils, onion flakes, Italian seasoning, rice, and bay leaves. Wrap the pasta in plastic wrap, and place in the jar. Seal tightly. Attach a label to the jar with the following instructions. Or you can use the ones I created HERE. 1 pound ground beef, black pepper to taste, garlic powder to taste, 1 (28 ounce) can diced tomatoes – undrained, 1 (6 ounce) can tomato paste, and 3 quarts water. Remove pasta from top of jar, and set aside. In a large pot over medium heat, brown beef with pepper and garlic; drain excess fat. Add diced tomatoes, tomato paste, water, and soup mix. Bring to a boil, then reduce heat to low. Cover, and simmer for 45 minutes. Stir in the pasta, cover, and simmer 15 to 20 minutes, or until the pasta, peas, lentils and barley are tender. Even though many of the ingredients did not have corresponding coupons, I was able to get everything I needed to make three jars for $7.85 thanks to Walmart’s low everyday prices. Expect to pay around $.79 per quart jar if you don’t have any on hand. Total cost per jar: $3.41! 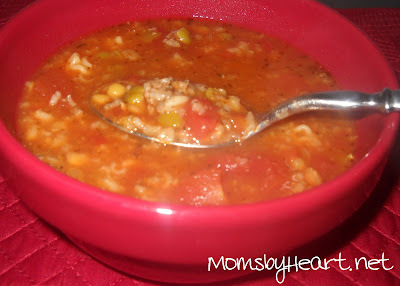 This makes a huge pot of soup that feeds my family of seven with leftovers to spare! And did I mention how yummy it is??? You could make a nice gift basket by adding additional ingredients needed: 28-oz diced tomatoes, 6-oz tomato paste and maybe a package of dinner rolls and a soup ladle! 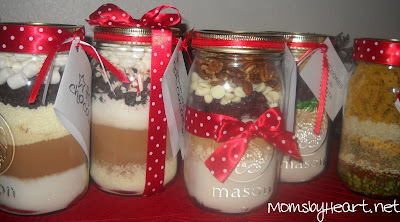 Check out my recipes for Cranberry Hootycreeks and Peppermint Hot Cocoa. Super cute!! Awesome ideas, thanks for sharing, now I know what to give to those people that are special to me!! This is such a sweet idea~ And I love the price tag! Thanks sooo much for sharing this with my Pink Hippo Party! Can't wait to see what you share next! WOW! What an amazing idea 🙂 Seriously one of the best gift ideas I have seen. 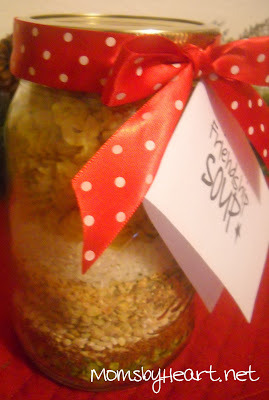 Who doesn't love soup in the cold winter??? Awesome. P.S. Thanks for linking it up today! I really don't like soups, but this recipe has me reconsidering that. And what I neat idea to give to those who already have all and everything. I know what beef bouillion cubes are, but what are granules?? Do I have to brek up a bunch of cubes? This soup is so yummy and GREAT to have on hand when serving a crowd! It is easy to make and just so GOOD!! Great with homemade rolls. YUMMO!!! !